Come visit this hidden treasure in Inwood, on the northern tip of Manhattan. The tranquility of the space resembles more a zen temple than a martial arts dojo in purpose and effect. Everything we offer at Aikido Up Here shares essentially the same purpose – finding peace through Aikido philosophy. ‘The door of the universe opens and universal light shines through when collectiveness of cooperative energy is celebrated through acts inspired by the state of connectedness’, this is according to Kojiki, one of the oldest texts of Japanese mythology and a great influence in the founding of Aikido. That cooperation, that intense energy, that joy…that is Aikido. Morihei Ueshiba, O’Sensei, founded this Japanese discipline, on the profound belief that it is a vital contribution towards world peace for the individual to kokoro no sentaku (literally, “launder the self”) and kokoro no tatenaoshi (“restore the self”)*. Aikido was developed for rediscovering a core sense of our selves so that we can live our life fully and truthfully. Though it originated as a martial art, Aikido was not created for the promotion of self-defense of any kind, therefore the class does not treat as such or glorify violence in any way. Instead meditation is the core of the program and is a blueprint for the physical practice. Aikido is a harmonious way to express ourselves and develop more awareness, focus, imagination, personal responsibility, collaboration and strength so that we can remember how to stand with kindness, guidance, openness and humility. And we can be kind to ourselves. Aikido is a way to express and practice cooperation. It is a celebration. The experience is the lesson. 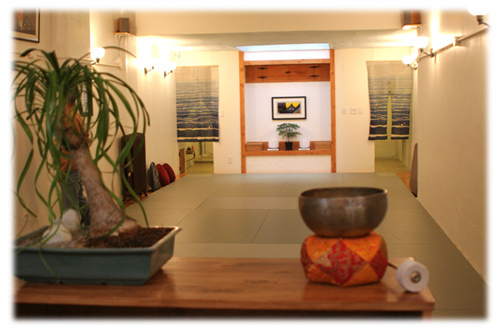 Aikido Up Here was built by Fuminori Onuma, Reiki & Karuna Reiki™ Master/Teacher, meditation & martial artist. He has been practicing healing, meditation and martial arts for over 20 years, in his native Japan and the United States. This is an independent dojo, and is not affiliated with any organization. You are invited to come and see this beautiful space and speak in person to learn more about our offerings. Please email AikidoUpHere@gmail.com or call 646- 483-8700 to schedule a visit. Zack, the General Manager, will welcome you at the entrance! * Quote by Morihei Ueshiba. Taken from Takemusu Aiki by Hideo Takahashi (1986).